I visited the newly formed virtual reality startup Teatime Research, tried out their Showroom app demo, and interviewed the team. They let me step into a virtual apartment house, move around, and modify it to my liking. The experience was great! Present during my interview were four of the six co-founders: Sakari Salli (CEO), Paavo Happonen (CTO), Noora Heiskanen (Creative Director), and Tommi Teronen (The Architect). Tommi mentions that he and Sakari were beginners at that time regarding their interest in VR. Paavo, in contrast, had already been working in the area for a long time and had practical experience. When they got together, the three guys started to think about who else could join their team. Tommi said that their customer is the homebuyer and the builder. The app helps sell homes but also helps the builder serve and interact with the customer after the deal is done. Before the purchase, the homebuyer can explore the available alternatives. After the purchase, the customer makes the final choices. In Finland, architects use BIM in housing design. The quality and level of detail of the model will define how much additional work is needed when using the model for VR. In the demo case, for example, the model was quite good. Still, the model builder had to trace all the surfaces manually. “The workflow is an essential question. I think that in the near future, when VR gear becomes commonplace, architects will pay attention to how to create the model from the VR point of view and any extra work will be minimized,” Sakari predicts. “Our app creates an easy user experience. Things are in 1-to-1 scale, and so on,” Tommi adds. 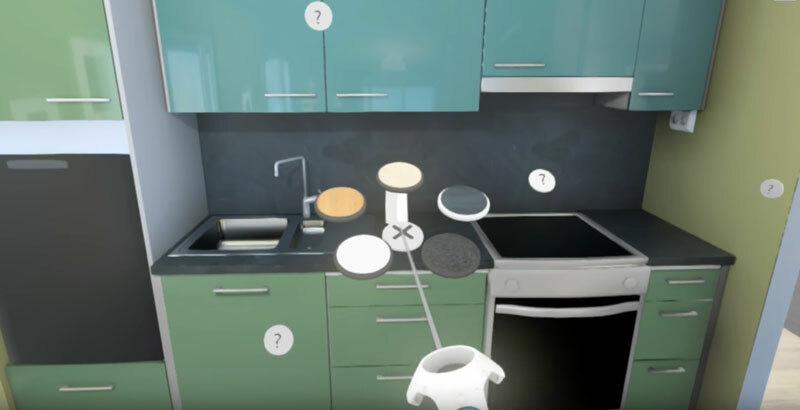 According to Sakari, their vision is a virtual environment where customers can not only move in spaces and make choices but also buy things for their home. What Makes Showroom Stand Out? “I’d sum up our app’s strengths in one word: immersion. Everything you do in our environment feels so natural that you don’t have to think about the technology behind it,” says Noora. Teatime Research already has two prospects, two companies that are really interested. In fact, the current demo is based on a real project. “There’s one more challenge in selling a VR app. It’s difficult to verbally explain what it is if you have not experienced it. Even though many people are interested in VR and read and hear about it, it is still remains a mystery until you obtain the gear and try it out,” Noora reminds. “Visors will become lighter and perhaps we’ll get rid of the cables one day,” Noora predicts. According to Paavo, graphics cards will improve, providing faster and more natural experiences. Eye-movement tracking will make rendering faster because you don’t have to render everything around you at full accuracy. To know more about Teatime Research, visit their website at teatimereseach.com. Most importantly, visit their office at Iso Paja in Helsinki and try out their awesome VR solution.